We produce our newsletter six times a year. New anti spam legislation took effect July 1, 2014. If you no longer wish to receive our Nautical Notes newsletter via email please visit our Privacy Notice for information on how to unsubcribe. To place an advertisement in the newsletter, contact . Classified ads are free to Members. There is a charge for display advertising. As reported in our February 2011 edition of Nautical Notes, our intrepid travellers explained that their cruising of the Caribbean is now over. We thought you’d be interested to know that we are flying the Power Squadron burgee along with the Royal Belgian Sailing Club burgee. 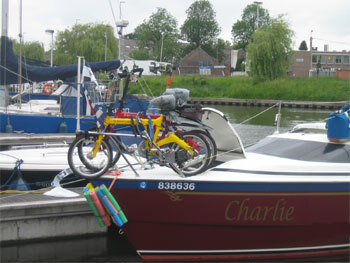 It took two years of planning but we finally got Charlie, our MacGregor 26, delivered to Antwerp and it went very well.